We’re on a mission to build better email. Agent helps lots of startups get up and running. Due to the nature of those relationships, we can’t always show you the inner workings of brand development – until now. Mail Human is our company; we built it from scratch. 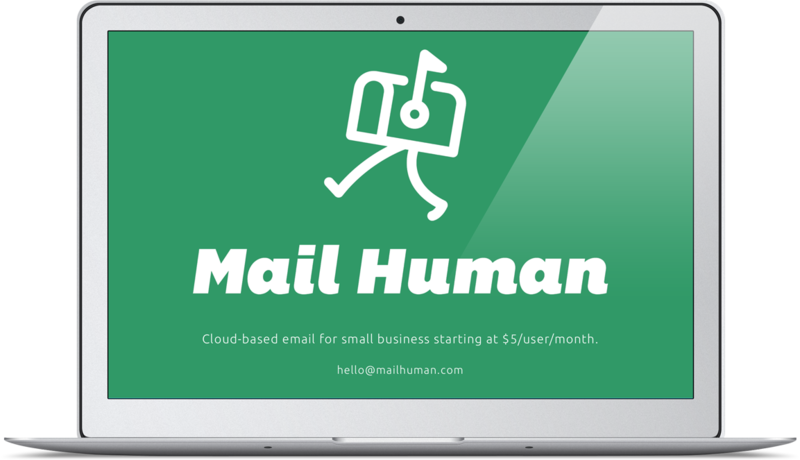 Simply put, Mail Human provides cloud-backed email and support for small businesses. If you’re interested in signing your business up, visit www.mailhuman.com. If you want a behind-the-scenes look of how we start a brand from scratch, keep reading. Warning: it gets ugly. Must be unique and easy to identify. It should describe or hint at what we do. It has to fit the client. Names can come from anywhere. Agent has a process we’ve used to help other clients find the perfect name. When we turned that process onto ourselves, we experienced the same frustrations lots of clients have. First, we came up with lots of blatantly horrible names. We can’t find the list, but here’s an example of how bad they were: Cousin Sam – because Cousin Sam doesn’t scan your emails like Uncle Sam and some big email providers. Hey, you were warned it would get ugly. We’re just getting warmed up. Second, all the names we liked were taken. We’d find a name, get excited, Google it, get depressed, rinse and repeat. It provides email – yeah, big deal. Lots of companies do this. It comes with support at no charge – ok, we can work with this. After that, it was just a matter of time. Email + human = Mail Human. (We dropped the “E.”) It’s unique, a little catchy (albeit basic), and we immediately liked it. After weeks of failure, we had our first success: a completely original name that kinda says what we do, and we actually like it. And now we have a new problem. How do we make other people like it enough to use our service? Without a logo, a brand is just a name. Mail Human had a problem. We’re a friendly company focused on human support in the world of email, which is kind of seen as techy, sterile and boring. We needed a logo that bridged the gap between what people thought about email and how we were changing it. We started by playing with the MH. See how the “M” kind of looks like an envelope? We loved that, but lots of other companies were already using it. We wanted to stand out, not blend in. The “H” looks good in the negative space, and after a valiant effort, we abandoned it for the mailbox illustration. The walking mailbox seemed to immediately convey the things you’d miss with only a name. It’s friendly, a little goofy, and you could see it walking over to help you – or at least I could. We’ve got a name and a logo, and we’re actually already getting new customers. We need to get online, and the clock is ticking. Mail Human is currently in beta. For early access, contact us here. Full site launching later this year. Back when we found our name, we immediately secured the domain: mailhuman.com. And since requests were already coming in, we built a splash page. A splash page is a landing page that lets users know you’re open for business even if you don’t have all your content ready yet. It’s good for a quick fix, but it’s bad form to keep this up for long. Up next: It's time to make some content. It's about to get real ugly. Is your brand under construction? This is the inside story of how Agent built one brand. We’ve helped lots of others. If you’re looking for help with brand launch or promotion, contact us below. How can Agent help you?